By default, the Monitor Agent uses HTTP to communicate with the agents it monitors. If HTTP is not available, the Monitor Agent changes automatically to SNMP. GroupWise 8 agents, GroupWise 7 agents, GroupWise 6.x agents and 6.x-level gateways, as well as the GroupWise agents provided with the GroupWise 5.5 Enhancement Pack, can be monitored using HTTP. 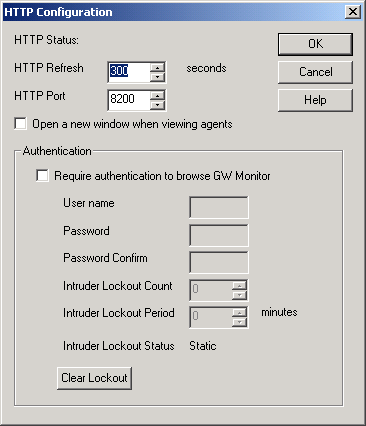 Agents dating from GroupWise 5.5 and earlier, as well as 5.5-level GroupWise gateways, must be monitored using SNMP. You can customize how the Monitor Agent communicates with your Web browser. At the Linux Monitor Agent Web console, click Preferences > Setup, then scroll down to the HTTP Settings section. HTTP Refresh: Specify the number of seconds after which the Monitor Agent sends updated information to the Monitor Web console. The default is 300 seconds (5 minutes). HTTP Port: Specify the port number for the Monitor Agent to listen on for requests for information from the Web console. The default port number is 8200. Open a new window when viewing agents: Select this option to open a new Web browser window whenever you display an agent Web console. This enables you to view the Monitor Web console and an agent Web console at the same time, or to view two agent Web consoles at the same time for comparison. NOTE:On Linux, at the Monitor Agent Web console, the HTTP Port field is not available. However, you can use the --httpport startup switch when you start the Monitor Agent to achieve the same functionality. For more information, see Section 67.0, Using Monitor Agent Startup Switches. Click OK to put the new HTTP settings into effect. Click Configuration > Poll Settings. On Linux, at the Monitor Agent Web console, click Preferences > Setup, then scroll down to the HTTP Settings section. Poll Cycle: Specify the number of seconds after which the Monitor Agent polls all monitored GroupWise agents for updated information. By default, the Monitor Agent starts 20 threads to poll monitored agents. You can use the /pollthreads startup switch to adjust the number of threads. For more information, see Section 67.0, Using Monitor Agent Startup Switches. By default, the Monitor Agent communicates with other GroupWise agents by way of XML. However, if XML is unavailable, the Monitor Agent automatically uses SNMP instead. Prior to the GroupWise 5.5 Enhancement Pack, GroupWise agents did not support XML, so the Monitor Agent must use SNMP to monitor these older agents. If you need to monitor older agents, see Section 63.3.2, Configuring the Monitor Agent for SNMP. If all monitored agents in the group require the same username and password in order to communicate with the Monitor Agent, you can provide that information as part of the Monitor Agent’s configuration. HTTP User Name: Provide the username for the Monitor Agent to use when contacting monitored agents in the group for status information. HTTP Password: Provide the password, if any, associated with the username specified in the field above. NOTE:On Linux, at the Monitor Agent Web console, the HTTP User Name and HTTP Password fields are not available. However, you can use the --httpagentuser and --httpagentpassword startup switches when you start the Monitor Agent to achieve the same functionality. For more information, see Section 67.0, Using Monitor Agent Startup Switches. If the monitored agents use different usernames and passwords, you are prompted to supply them when the Monitor Agent needs to communicate with the monitored agents. Select Apply options to subgroups if you want subgroups to inherit these settings. Click OK to put the specified poll cycle into effect. The Monitor Agent must use SNMP to communicate with GroupWise agents that date from earlier than the GroupWise 5.5 Enhancement Pack. You can customize how the Monitor Agent communicates with such older agents and how it communicates with SNMP monitoring and management programs. On Linux, at the Monitor Agent Web console, click Preferences > Setup, then scroll down to the SNMP Settings section. Specify the number of seconds after which the Monitor Agent polls all monitored GroupWise agents for updated information using SNMP. Time-out: Specify the number of seconds the Monitor Agent should wait for a response from servers where GroupWise agents run. Number of Retries: Specify how often the Monitor Agent should try to contact the servers where GroupWise agents run. SNMP Community Strings: Provide a comma-delimited list of community strings required to access the servers where GroupWise agents run. 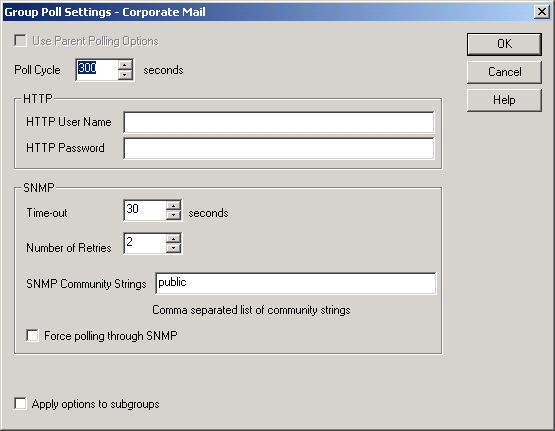 Force polling through SNMP: Select this option to use SNMP polling instead of the default of XML polling when contacting servers where agents in the group run. Click Apply options to subgroups if you want subgroups to inherit these settings. Click OK to put the new SNMP settings into effect. Make sure the GroupWise agents you want to monitor using SNMP are enabled for SNMP. See Section 37.6.1, Setting Up SNMP Services for the POA and Section 42.6.1, Setting Up SNMP Services for the MTA. The same instructions can be followed for all GroupWise 5.x, 6.x, 7, and 8 agents.